Now we just need a Pablobuchet! 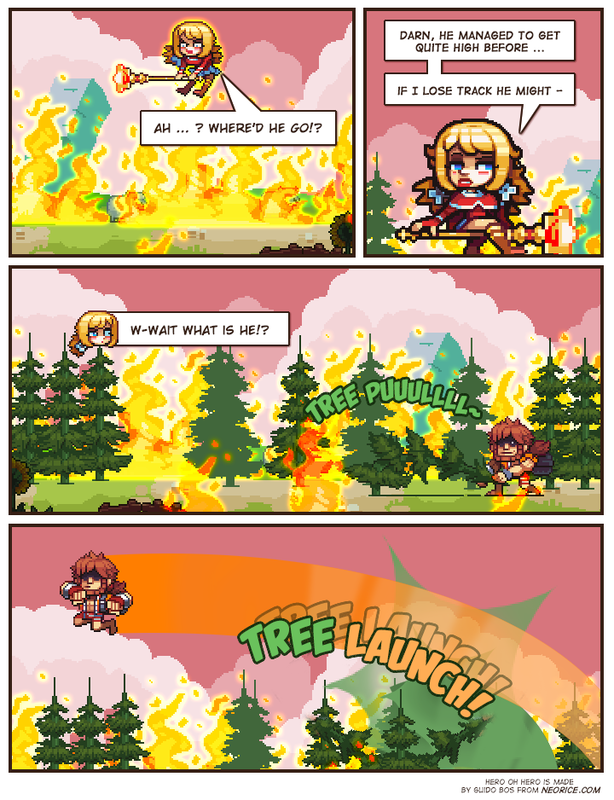 At panel three I thought Burk is going to save the tree from fire by pulling it out of the ground. But instead he used it in a selfish manner, to put himself off the ground. Shame, Burk. How does Burk find trees capable of that? I have difficulty thinking of any species of tree capable of being bent back that far, and then launching a pantsless muscleman in a significant height and distance catapult arc like that. Maybe Burk is more magical than he lets on? @anonymous coward Heroland must have very flexible trees. @anonymous coward, given everything else that has gone on in this comic, a bendy tree is where you draw the line on believability? Bit strange but fair enough, I suppose. Not pointing at that as any sort of defining line, it's just one of many hints that Burk is more than only muscles, wits, courage, and social awkwardness. This leads to the next step: Wild mass guessing what else Burk may be. I'll open with the guess of part-supernatural ancestry, like a nymph or a dryad in his family tree or something like that. That or they are still following videogame rules. High level Monks tend to be quite overpowered and get bonus magic and status resistances. OK, not actually about this page per say: But is it just me, or did Piper go from pampered noble girl to anime-style schoolgirl/witch when this fight started? I mean, the witch part comes from the staff to broomstick transformation, but there is something "anime schoolgirl" about her current presentation that wasn't there before. @Cluedrew What, her cutie-cannoning that french guy to oblivion wasn't anime enough for you? :P Or do you mean the schoolgirl part? Just re-reading it and realised it could've came across a bit a***y.
Burk's gloves go missing for one panel again it seems. Unless Burk used some invisible rope, this definitely violates the laws of physics. Which means Burk does have some magic power. How is it classified? Unless Burk used some invisiblerope, this definitely violates the laws of physics. Which means Burk does have some magic power. How is it classified? Burk gloves got teleport for absurd things! I was referring to the school girl part yes. The staff to broom thing also seemed a bit out of place from what (admittedly little) we have seen of her so far. Even with flying I would have expected something more like a summoned steed. Again, she seemed very "pampered noble" up to this point. Next page is out... this is never going to get a reply is it?